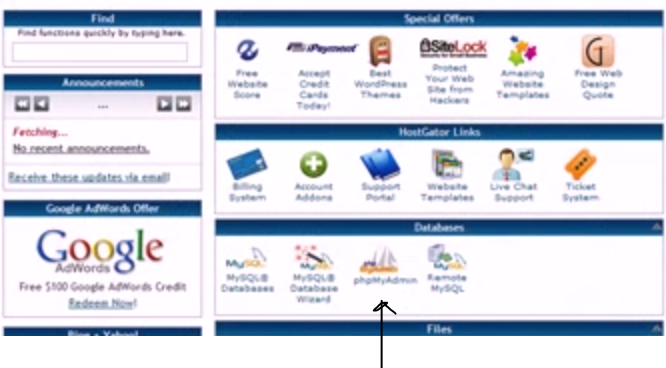 – Most hosting companies, such as HostGator.com, will supply a server with MySQL. Click to go back, then click back to the home page. Now click on phpMyadmin on the homepage. Click on the name of your database. If, by any chance, you have an SQL file you want to import – you can click on the import tab, to import an sql file to create your database. Click on the SQL tab to create a table for your database. Create a table with the “CREATE TABLE” command. You can insert data into your table using the INSERT command. You can also save data in excel as a CSV. Do not add column names to the data in the spreadsheet. Just the data itself. The tab name on your spreadsheet, should also be the same as your tablename. The SELECT command is used to select data from a database, the results are stored in a result table called the result-set. * is called the wildcard statement. This query would give a distinct list; with one result for each town. This will retrieve 10 rows/entries of data, starting at the 6th entry. ORDER BY – will automatically arrange results low to high, alphabetically or numerically. The above statement will treat Wrexham as a value, not a column name or anything, and will return all the IDs and names from people who live in Wrexham. AND requires both to be true. This query will return people from Wrexham, who are 22 years old.